We suggest soft constraints as a mean to parametrically represent and solve “weighted” Argumentation problems: different kinds of preference levels related to arguments, e.g. a score representing a “fuzziness”, a “cost” or a probability level of each argument, can be represented by choosing different semiring algebraic structures. The novel idea is to provide a common computational and quantitative framework where the computation of the classical Dung’s extensions, e.g. the admissible extension, has an associated score representing “how much good” the set is. Preference values associated to arguments are clearly more informative and can be used to prefer a given set of arguments over others with the same characteristics (e.g. admissibility). Moreover, we propose a mapping from weighted Argumentation Frameworks to Soft Constraint Satisfaction Problems (SCSPs); with this mapping we can compute Dung semantics (e.g. admissible and stable) by solving the related SCSP. To implement this mapping we use JaCoP, a Java constraint solver. 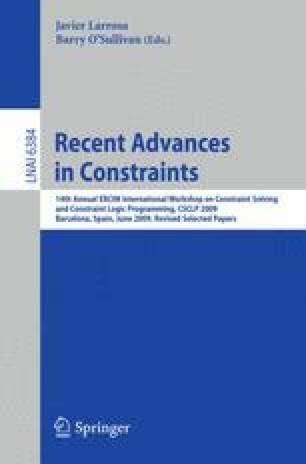 Research partially supported by MIUR PRIN 20089M932N project: “Innovative and multi-disciplinary approaches for constraint and preference reasoning”.